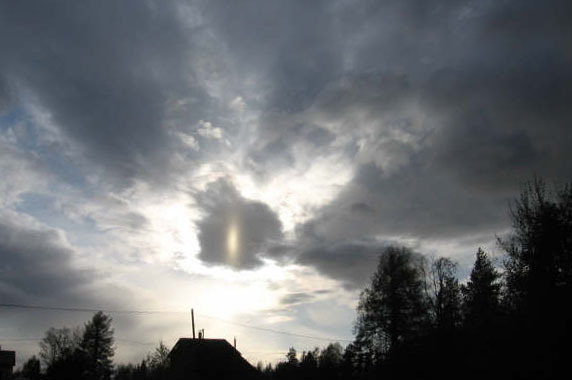 This subsun-like pillar on front of dark cloud was photographed by Jenni Elina Holopainen on 18. May 2006 in Pyytivaara, Finland. The position of the pillar is apparently the same as that of the Sun's behind the cloud, which is better revealed by the cloud rays in another photo. So how this is possible? The explanation must be a reflection of sun light from still water body and further reflection of this light from ice crystals that are precipitating from the Altocumulus clouds seen in the picture. Thus we are looking here - not at the subsun - but at "supersun". The best sun pillars are usually seen in the icy virga of the Altocumulus clouds. This is because virga can consist of very big plate crystals that have plenty of horizontal surface to reflect sun light. Thus it would be expected that if this phenomenon were to occur, it would be Ac virga if anything. In high clouds it's impossible to see this, becase there is nothing behind the crystals to block the Sun. And when diamond dust occurs, waters are usually frozen. Thus ice crystals precipitating from middle level clouds is perhaps the only possible formation for the phenomenon Holopainen photographed. In yet another photo taken by Holopainen, a curved Ac virga can be seen in the middle of the picture above the lake. This is the lake that most likely was responsible for the reflection. Actually this is not the first observation we have of this kind of phenomenon. In the end of 90's in Oulu a pillar of light (with no distinct subsun like appearance) was observed in a similar manner. Wow!! That could be a new halo form! Right Michael. At least my list of halo forms is now one longer. Might take some time to see it though, but checking for it actively at the right times and places surely increases chances. I was too thinking supersun sound no good and actually expected you guys to give suggestions. But as subsun is formed from reflection, I think "reflection subsun" might not be the best term either. Suprasun was also one that I was thinking. Let's hear what people have to say, then I change it. I would not call this as supersun. We would have supersun when sun light hits directly ice crystals and with extra inner reflection on upper basal face causes a supersun. This is, of cource, very hard to happens with the sun, but with artificial light sources it can happens and do happens often. But in artificial light cases supersun looks like a pillar (often misindentified as sun pillar). We also have also used name "reflected Lowitz arcs" which are forming from different mechanism. Reflected and reflection are so close words that they may cause confusion. So we are lacking a good terminology here. I would not call this as a new halo form. It is a new halo related effect. Because difference between known halos is not caused by ice crystals but other mechanism basically unrelated with halo formation. I think the Oulu case (Jarkko Korhonen photographed?) has only a pillar. At least what I saw was a pillar (I did not have a camera with me). But I do not remember excatly was there similar brightening in photos like in Jenni's photos. Just one other argument: 'reflection subsun' is the opportunity to get at least at one point some systematical terminology. At this point, the prefix 'solar', 'lunar' refer to the sun, moon as being the primary lightsource. Similarly, the prefix 'reflection' could refer systematically to a reflection of a water surfacee being the primary source. In a meanwhile, I changed the title to less explosion risky version. Also made some changes in the text. The reflected subsun would be consistent with reflected rainbows, glories and cloud rays and whather else there might be that arise from still water surfaces. But the subsun itself is so pure reflection phenomena, that there is a chance for confusion. Anyway, it's the tradition in halo business to call the halos whatever names you like and then change your naming whenever you feel like. It's kinda poor situation for beginning observers, but other than that, I like the freedom in it. Don't care whatever you might call them, as long as we have some mutual understanding of what we are talking about. It might not be a new halo, but from the observers point of view, this is such a cool thing that I like to call it as such. As for the "reflected Lowitz arcs", I made it and I don't like it and would like to change it. Some more info on this reflection subsun. In our mailing list Krista Vajanto wrote she has seen it a couple of times over the sea in the early winter when ice has just formed. Wow, I've never suspected that's possible to see. But I think also, it's a new halo but not a seperate halo type (like lower or upper tangent arc). I think for this, Over- or Supersun it's a good name. Then plate arc 1---the subsun---should theoretically be considered different from plate arc 2. (Plate arc 1 is reflection from a horizontal mirror with only the top face silvered. Plate arc 2 is reflection from a horizontal mirror with only the bottom face silvered.) So plate arc 2 might need a name. Viewpoint #2. We allow the reflection(s) to occur from either side of the reflecting plane. So then Par 315 is the same halo as Par 325, as it has always been. And plate arc 1 is the same as plate arc 2. Then what Jenni saw is just a subsun with the light source below the horizon. There is no new halo. I can see advantages and disadvantages to both viewpoints. I believe that we need to think a lot harder before decreeing any new names. We just have not thought systematically about ray paths other than those of length two. As you know, I am in general opposed to putting people’s names on halos, but the confusion surrounding Jenni’s halo might call for a temporary exception. Whatever we decide to call the halo, the photo is great. Thank You ! The situation was just like from a very odd story, that shine on the sky, I heard the silence, no wind. It was a bit scary - I felt my self small and fragile in front of that shine. The World is something to see, this life, these forms of the source of the energy called our Sun. what about a secondary halo from the subsun? I think the layer of ice crystals itself can act like a water surface and reflect sufficient light for halos.